A song in the 1998-film “Jeans” directed by Shankar- dance master Raju Sundaram connects himself to some wires and a computer. As he dances inside a room, an image of Aishwarya Rai dances on the stage, with the exact same movements of Raju Sundaram. This technology has now really been used to make a full film- Kochadaiiyaan- performance capture. Usually the Tamil audience expects only a good story in a film. If the story is good, the movie is heavily appreciated, no matter how miserably it has been made. A few Tamil films from the 1980s justify this statement. This obsession for a story is so high that currently, a reputed director from the Tamil film industry is promoting his movie as a new effort- one without a story. It is pitiable- Arabian and European industries have been making such fantastic films since time unknown. Meanwhile this director claims it is a tribute to 100 years of Indian cinema. Bravo! 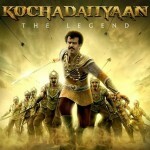 This is mentioned here because Kochadaiiyaan has a fantastic story and screenplay. That has been enough for a majority of the audience to believe it is superb film. No, a good story doesn’t necessarily make a good film. There are a few more things. Kochadaiiyaan- the film is about the tussle between two countries Kalingapuri and Kottaipattinam. It opens with a boy named “Rana” jumping into an ocean to be carried away to another country. The screenplay travels with excellent pace from there. 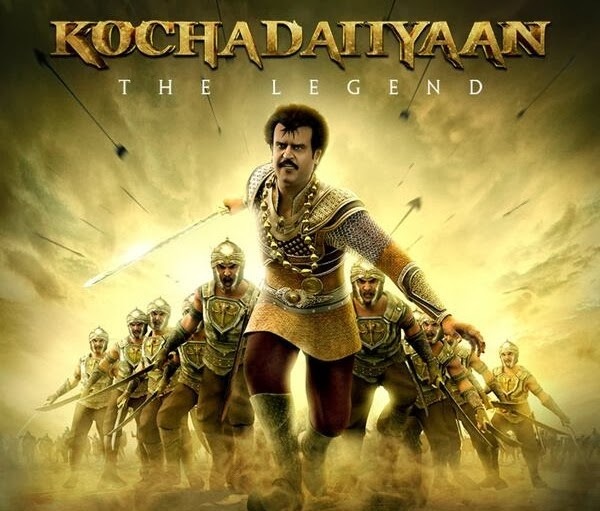 There are many big stars in Kochadaiiyaan- Rajinikanth, Deepika Padukone, Nasser, Shobana, Jackie Shroff, Sarath Kumar, Aadhi, and late comedian Nagesh. However, it might take you 3 hours to recognize the characters played by Aadhi and Sarath Kumar. Who could’ve imagined that we will witness the legend Nagesh once again on screen! This is a brilliant effort. Especially the artists who dubbed in Nagesh’s voice deserve greater recognition. However, the animation character couldn’t get close to the quick movements, slapstick style and body language of the legend, at least in terms of speed. Also, the character ‘Rana’ has been made with a wheatish complexion which might not please the audience. It can be seen that the dark complexioned Kochadaiiyaan character is received well by the audience. Tamil cinema has been the pioneer in bringing new technologies from across the world to Indian cinema, in many cases- either it was director Shankar or Kamal Hassan. But this time, it is Soundarya Rajinikanth. Though the film has motion capture and performance capture technologies, it lags behind in detailing. The characters speak Tamil but wear north-Indian style dresses. It is wrong to compare this film’s animation quality with Hollywood films like Avatar. However, though ‘Avatar’ was a Hollywood commercial film, the film had a lot detailing apart from the animation- there was a big research to create a separate language, tradition and landscape for the new planet ‘Pandora’. Kochadaiiyaan doesn’t have such minute details. It only relies heavily on the story. Two countries are shown- Kalingapuri and Kottaipattinam. But there is no detail about the people of the 2 countries, their culture, or lifestyle. It is not that there must be some detail for that in the story- just a few details ‘on the screen’ would have sufficed. We must be able to differentiate the two countries at one glance. In the climax, elephants with long faces and big ears run into the battlefield. Aren’t those African elephants? Maybe, they imported African elephants like they did Persian horses! Next, if such a film requires a budget of 500 crores, it must be made with 500 crores. The budget of Kochadaiiyaan is 125 crores. But that is not a call to criticize the film. At the same time, it is even worse to boast a lot about the film. Even if it had been made with a lesser budget as a live-action film, it would have been a commercial entertainer like the A.P. Nagarajan films of the past. The film definitely has many interesting dialogues in that style! If you have not watched Kochadaiiyaan yet, please avoid reading the following paragraphs in quotes, as they might be spoilers. “1. It is shown that the enemies poison the food of the Kottaipattinam soldiers in the ship. Consequently, Kochadaiiyaan lands in Kalingapuri to save them. However, earlier the medicine man says that the medicine he has will be enough only to save few of the soldiers. In that case, before landing in Kalingapuri, he would’ve already given the medicine to few soldiers and left them in the ship. Kochadaiiyaan leaves the remaining soldiers in Kalingapuri to save their lives. Hence, Kochadaiiyaan should’ve returned to Kottaipattinam with few soldiers or at least the medicine man. But it is shown that Kochadaiiyaan comes back all alone. Towards the end of the song in the film ‘Jeans’, as Senthil plays some mischief in the computer equipment the image of Aishwarya Rai starts changing its shape and size, in a chaotic manner. In the same manner, there are a lot of problems in animation in Kochadaiiyaan- almost all characters have squint eye or bent legs. Soldiers and people who are shown from a height are just shown as a ‘bunch of dots’. In some shots, people in the background are in a blurred state which looks very awkward. Some shots are shot really using a camera and some are created using a computer. For example, when a landscape or the palace is shown from an aerial view, it is not shot using a camera. The next shot with a character is from a camera. The difference between the camera movements in these shots is very distracting. The efforts put in to create song sequences could’ve been used in much more detailing in the rest of the film. Another weak department of the film is ‘editing’. At many points, shots resembling video game graphics are inserted irrelevantly. In action sequences, it is being very difficult to understand what is really going on in the scene- so many jump cuts and close-up shots inserted- especially in the scene where Rajinikanth is in jail and wolf-like creatures start attacking him. It could be the flaws in camera and animation that have led to such sloppy editing. In fact, Kochadaiiyaan has a strong story that can be compared to films like ‘Braveheart’ and ‘Troy’. What could’ve turned out to be a trendsetter in Tamil cinema has turned into an average photorealistic film. People who have gained world cinema(?) knowledge by watching films like “Transformers” and “Harry Potter” may not like the animation quality of Kochadaiiyaan. However, it can still be appreciated as the first effort from Indian cinema and also, as a film with a good story and screenplay. 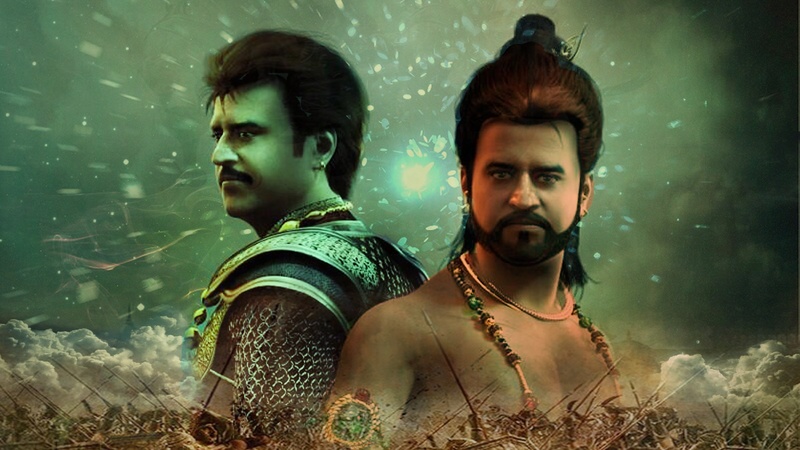 Though it has some clichés, Kochadaiiyaan has given a new dimension to historical films in Tamil cinema. True! Sarath kumar was not at all recongnizable. Someone else could have acted. The expected addition to the star value resulted in disappointment! I think Adhi could be recognized! Story , screenplay, dialogues were amazing. KSR has got back the magic again it seems. The plot holes given here are amazing! Even after so many days of watching the film, I could not even think about them. Bringing back Nagesh was unbelievable! Kudos to the person who acted and dubbed for it! Even in wiki, we cannot find the person’s name! Sad. Tamil Cinema definitely should come forward to recognise such guys. Great effort in animation, but such a good story with the likes of being a ‘Brave Heart’ as specified here, definitely need not have been experimented. To experiment animation, you could also experiment with a Tortoise and rabbit story. Such a beautiful content and a period film has slipped out of tamil cinema’s library! Hope ‘Rana’ will try to compensate something! !